Once this ancient organic material thaws, microbes convert some of it to carbon dioxide and methane, which can flow into the atmosphere and cause more warming. Scientists have estimated that the process of permafrost thawing could contribute as much as 1.7 degrees Fahrenheit to global warming over the next several centuries, independent of what society does to reduce emissions from burning fossil fuels and other activities. In Alaska, nowhere is permafrost more vulnerable than here, 350 miles south of the Arctic Circle, in a vast, largely treeless landscape formed from sediment brought down by two of the state's biggest rivers, the Yukon and the Kuskokwim. Temperatures 3 feet down into the ground are less than half a degree below freezing. This area could lose much of its permafrost by midcentury. That, said Max Holmes, senior scientist and deputy director of the research center, "has all kinds of consequences both locally for this region, for the animals and the people who live here, as well as globally. "It's sobering to think of this magnificent landscape and how fundamentally it can change over a relatively short time period," he added. But on this wide, flat tundra, it takes a practiced eye to see how Alaska is thawing from below. At one of the countless small lakes that pepper the region, chunks of shoreline that include what had been permafrost have calved off toward the water. Nearby, across a spongy bed of mosses and lichens, a boggy depression likely formed when the ice in the top layers of the permafrost below it melted. In July, the Woods Hole scientists, along with 13 undergraduate and graduate students working on projects of their own, set up a temporary field station on a nameless lake 60 miles northwest of Bethel, which with a population of 6,000 is the largest town in the region. They drilled permafrost cores with a power auger, took other sediment and water samples and embedded temperature probes in the frozen ground. Later, back in the lab at Woods Hole, they began the process of analyzing the samples for carbon content and nutrients. The goal is to better understand how thawing permafrost affects the landscape and, ultimately, how much and what mix of greenhouse gases is released. "In order to know how much is lost, you have to know how much is there," said Sue Natali, a Woods Hole scientist and permafrost expert. Even in colder northern Alaska, where permafrost in some parts of the North Slope extends more than 2,100 feet below the surface, scientists are seeing stark changes. Vladimir E. Romanovsky, a permafrost researcher at the University of Alaska, Fairbanks, said that temperatures at a depth of 65 feet have risen by 3 degrees Celsius (about 5.5 degrees Fahrenheit) over decades. Near-surface changes have been even greater. At one northern site, he said, permafrost temperatures at shallow depths have climbed from minus 8 degrees Celsius to minus 3. "Minus 3 is not that far from zero," Romanovsky said. If emissions and warming continue at the same rate, he said, near-surface temperatures will rise above freezing around the middle of the century. There is plenty of debate among scientists about when and how much of Alaska's permafrost will thaw. And there is no doubt that thawing of the full depth of permafrost would take millenniums. But Romanovsky said that his and others' work shows that permafrost "is not as stable as people thought." In addition to greenhouse-gas emissions, thawing wreaks havoc on infrastructure, causing slumping of land when ice loses volume as it melts. The main road in Bethel, where average temperatures have risen about 4 degrees Fahrenheit since the mid-20th century, is more of a washboard than a thoroughfare because of shifting ground. Building foundations in Bethel move and crack as well. Some roads, airport runways and parking areas have to be reinforced with liquid-filled pipes that transfer heat out of the permafrost to keep the ground from slumping. The thawing of permafrost is a gradual process. Ground is fully frozen in winter, and begins to thaw from the top down as air temperatures rise in spring. As average temperatures increase, this thawed, or active, layer can increase in depth. At the field station, the researchers are especially interested in how wildfires affect the permafrost. Because burning removes some of the vegetation that acts as insulation, the theory is that burning should cause permafrost to thaw more. Parts of the tundra here burned in the 1970s and in the summer of 2015, so the researchers took cores from both burned and unburned areas. Scientists wrestled with the bulky power auger as its stainless steel tube worked its way into the hard permafrost. Cores — often containing thin layers of solid ice — were labeled, packed in a cooler and sent by helicopter to a freezer in Bethel. Thawing permafrost underneath or at the edge of a lake can cause it to drain like a leaky bathtub. 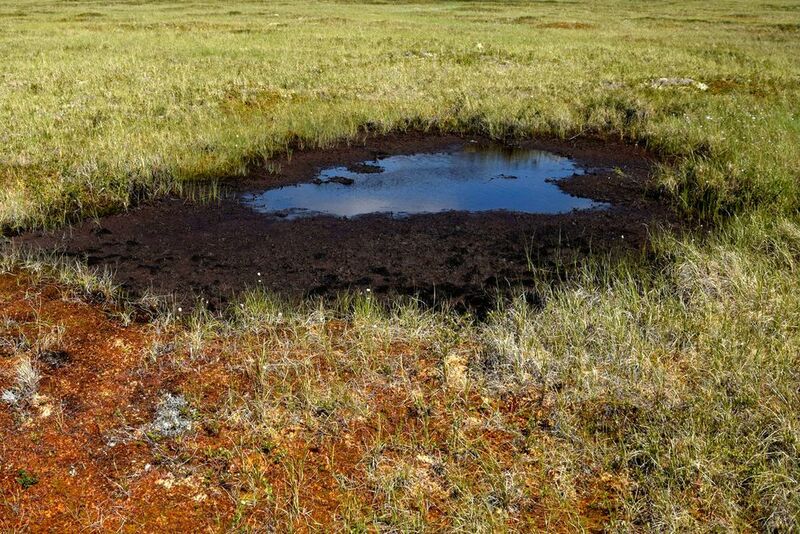 Thawing elsewhere can bring about small elevation changes that can in turn lead to changes in water flow through the landscape, drying out some parts of the tundra and turning others into bogs. Beyond the local effects on plant and animal life, the landscape changes can have an important climate change impact, by altering the mix of carbon dioxide and methane that is emitted. Although methane does not persist in the atmosphere for as long as carbon dioxide, it has a far greater heat-trapping ability and can contribute to more rapid warming. So the researchers devote much of their time to studying the flow of water and the carbon and nutrients it contains. "It's one of the big questions to tackle — what's wet and dry now, and what will be wet and dry in the future," Natali said. If the decomposing permafrost is wet, there will be less oxygen available to microbes, so they will produce more methane. If the permafrost is dry, the decomposition will lead to more carbon dioxide. Estimates vary on how much carbon is released from thawing permafrost worldwide, but by one calculation emissions over the rest of the century could average about 1.5 billion tons a year, or about the same as current annual emissions from fossil-fuel burning in the United States. Already, thawing permafrost and warmer temperatures are being blamed for rising carbon emissions in the Alaskan tundra, both here and farther north. In a study earlier this year, researchers found that bacterial decomposition of thawed permafrost, as well as carbon dioxide produced by living vegetation, continues later into the fall because freezing of the surface is delayed. The rise in emissions has been so significant, the researchers found, that Alaska may be shifting from a sink, or storehouse, of carbon, to a net source. Holmes said that shift was not surprising given the climate trend, and he would expect that sub-Arctic parts of Siberia, Canada and other areas with permafrost may be undergoing similar changes. "There's a massive amount of carbon that's in the ground, that's built up slowly over thousands and thousands of years," he said. "It's been in a freezer, and that freezer is now turning into a refrigerator."